We are not here in physical form on this planet very long. What do we do and what do we learn while occupying these bodies of ours? In the late ’60s and early ’70s particularly, fellow souls explored the WTF and What Is It?, and often attached themselves to a larger group of explorers for the purpose of discovering at an accelerated pace. Elsewhere we published books about The Process Church, communal/tribal living, Future Primitivism, and coming in the not too distant future, The Mel Lyman Family. 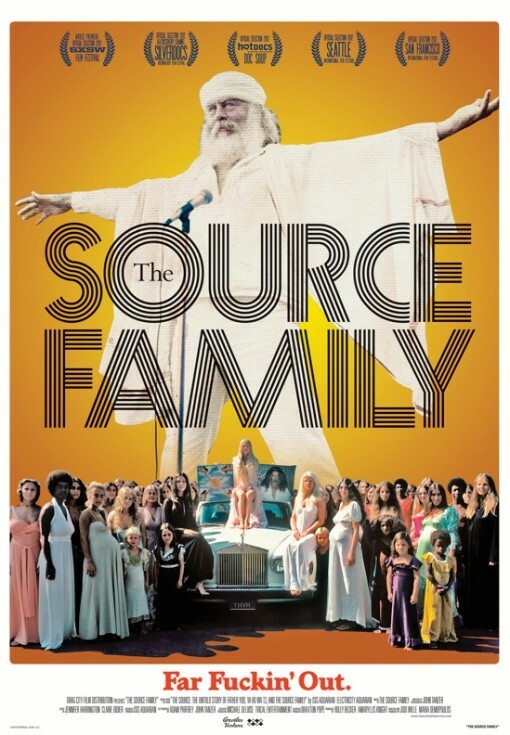 Under the Process Media imprint, Jodi Wille and I published this book/cd by Isis Aquarian and Electricity Aquarian, The Source: The Untold Story of Father Yod, YaHoWha 13, and The Source Family. The Source Family — whatever one thinks about cults or communes — has been extremely influential in regard to healthy eating and exploratory beliefs. Now that Jodi has focused her attention to creating films rather than books, she has put together, with the help of Maria Demopoulis and many others, a full-length documentary based upon the Process Media publication. I must say that this film is an amazing thing, chock full of film from the period, and I’m proud to be acknowledged as its Co-Producer. There are a lot of not-to-be missed events happening across the states during the month of May. THIS website has information about all the screenings and events, and they begin at the end of April and throughout the coming month.